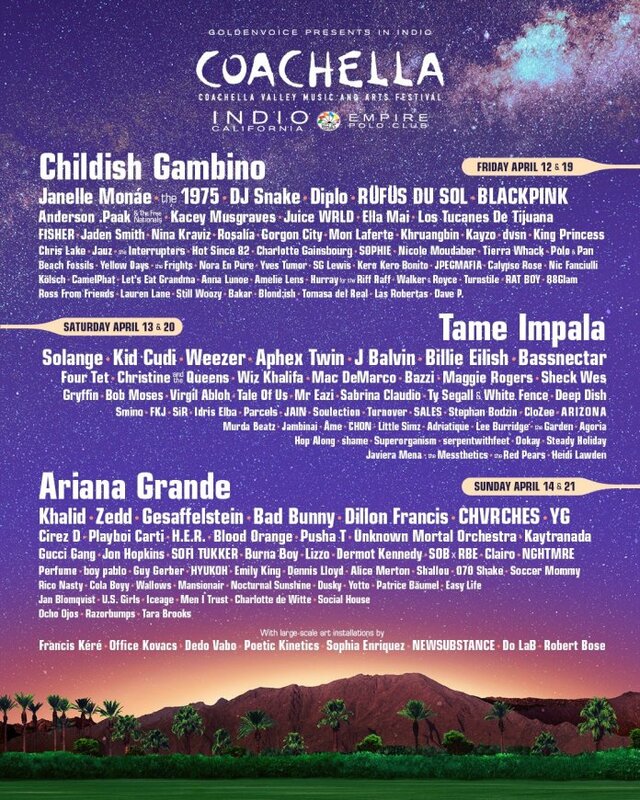 Childish Gambino, Tame Impala and Ariana Grande are the three headliners on the newly released Coachella 2019 lineup. Kacey Musgraves, Juice WRLD, Ella Mai, Janelle Monae, The 1975, DJ Snake, Diplo, Anderson .Paak Solange, Kid Cudi, Weezer, Billie Eilish, Khalid, Zedd, H.E.R., Gesaffelstein, CHVRCHES, YG, J Balvin, Bad Bunny, King Princess and Maggie Rogers are among the other scheduled acts at the 20-year-old Indio fest. Gambino will headline on Fridays (4/12 and 4/19); Tame Impala on Saturdays (4/13 and 4/20); and Grande on Sundays (4/14 and 4/21). Check out the whole lineup below. We look forward to watching the streaming video from our couch-ella. YouTube will again livestream the first weekend and, for the first time ever during weekend two, deliver a curated live experience featuring performances, artist vignettes and behind the scenes looks at Coachella. In addition, YouTube Music and YouTube Premium subscribers in the U.S. will have exclusive access to a dedicated allocation of passes for purchase for each weekend.